Optimized Thermal Systems in Maryland is developing an advanced heat exchanger that minimizes joints by 90 percent compared to current models to reduce refrigerant leakage. By minimizing the joints, the refrigerant stays where it should be. The University of Florida is developing a prototype that combines a water heater, dehumidifier and air cooler, which could result in more efficient heat transfer. This technology provides enhanced dehumidification control in residential buildings, resulting in better comfort and significant energy savings. Dais Analytics in Florida, in partnership with Oak Ridge National Laboratory (ORNL), is developing a new membrane-based rooftop air conditioner, which would use water as a refrigerant instead of conventional chemicals. Not only is this technology perfect for sweltering, humid summer nights, but it could also save 30-50 percent in electrical consumption compared to today’s rooftop units. 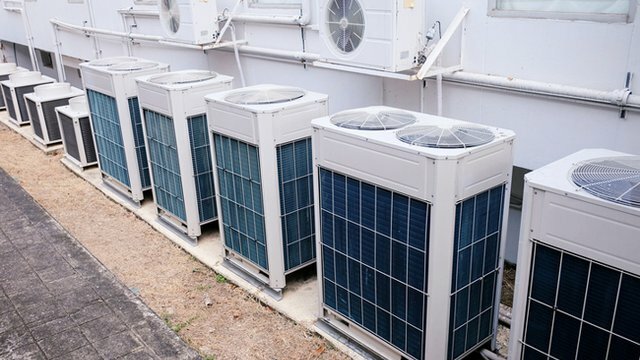 United Technologies Research Center in Connecticut is exploring electrocaloric, solid-state technology to develop a heat pump that will keep a space cool without using any chemical refrigerants. This technology is ideal for residential and small commercial buildings. It’s small and quiet, and could result in 25 percent system efficiency improvement. And, with fewer mechanical parts, overall reliability could be improved. Oak Ridge National Laboratory in Tennessee, in partnership with Georgia Tech and IntelliChoice Energy, is developing an energy storage system that integrates with HVAC units to reduce the overall energy requirements of A/C systems by using waste-heat that would otherwise be lost in traditional systems. Integrating ground-level diverse energy storage with HVAC could reach overall energy storage efficiency of 70 percent and improve HVAC performance by 35 percent.